For the Welsh rugby union international, see Duncan Jones (rugby player). He is the son of the late English singer-songwriter David Bowie. Duncan Zowie Jones was born in Bromley, London, on 30 May 1971, the only child of English singer-songwriter and musician David Bowie and his first wife, Angela "Angie" Bowie (née Barnett), an American model and actress. His maternal grandfather, George, was a United States Army veteran and mining engineer who ran a mill for the Cyprus Mines Corporation, while his maternal grandmother, Helena, was a naturalized Canadian. His mother was born and raised in Cyprus, and has Polish ancestry. His birth prompted his father to write the songs "Kooks" and "Oh! You Pretty Things" for his 1971 album Hunky Dory. Mostly raised by his Scottish nanny, Marion Skene, Jones spent time growing up in London, Berlin, and Vevey. He attended the first and second grade at the Commonwealth American School (now the International School of Lausanne) in Lausanne. When his parents divorced in February 1980, his father was granted custody of eight-year-old Jones (who was then known as "Zowie Bowie" to rhyme with his father's stage name) and he visited his mother on school holidays until ending contact with her at age 13. At age 14, he enrolled in the Scottish boarding school Gordonstoun. At the age of 12, he decided that he preferred to be called "Joey", and used this nickname until shortening it to "Joe" in his later teen years. The press reported that he went by "Joe" in 1992 when attending his father's wedding to fashion model Iman, where he was the best man. He reverted to his birth name around the age of 18. Jones is the half-brother of Alexandria "Lexi" Jones (born 2000), the daughter of his father and his father's second wife, Iman. He is also the half-brother of Stacia Larranna Celeste Lipka (born 1980) from his mother's relationship with musician Andrew Lipka, better known as Drew Blood. He has a stepsister, Zulekha Haywood (born 1978), who is the daughter of Iman and former NBA basketball player Spencer Haywood, Iman's second husband. By 1995, Jones graduated with a bachelor's degree in philosophy from the College of Wooster. He then pursued a Ph.D degree at Vanderbilt University in Tennessee, but left before completion to attend London Film School, where he then graduated as a director in 2001. Whilst growing up, Jones dreamed of becoming a professional wrestler, and his father frequently praised what he called Jones' "natural strength". Jones was one of many cameramen at his father's widely televised 50th birthday party directed by Englishman Tim Pope at Madison Square Garden in 1997 and also at two BowieNet concerts at Roseland Ballroom in New York City in June 2000. He was also the in-game cinematics director for the political simulator Republic: The Revolution, as well as scripting elements of the game. Jones directed the 2006 campaign for the French Connection fashion label. The concept of 'Fashion vs Style' was to re-invigorate the brand and move it away from the former incarnation of FCUK, which style pundits believed had become tired and overused. The advert debuted in the week ending 20 February 2006 and featured two women (representing fashion and style) fighting and briefly kissing each other. The advertisement generated 127 complaints to the Advertising Standards Authority. Jones's first feature film, Moon, was nominated for seven British Independent Film Awards in 2009, and won two, Best British Independent Film, and the Douglas Hickox Award for Best British Director on their debut feature. It was also nominated for two BAFTA Awards at the 2010 ceremony, winning Jones the BAFTA Award for Outstanding Debut by a British Writer, Director or Producer. The film has received 19 other nominations from film festivals and societies, including the BAFTA Carl Foreman Award. He directed the Summit Entertainment project Source Code, a science-fiction thriller from Vendome Pictures, which was produced by Mark Gordon. Source Code was released on DVD and Blu-ray on 26 July 2011 in the United States. Jones directed and co-wrote Warcraft, based on the video game series of the same name, which was released in the summer of 2016. Jones next film would return to the science fiction genre and be called Mute, starring Alexander Skarsgård and Paul Rudd. Jones had been developing the project for years and described it as a "spiritual sequel" to Moon, and was inspired by Ridley Scott's Blade Runner. The film, set in Berlin forty years in the future, follows a mute bartender investigating his lover's disappearance. The film was produced and released by Netflix, and became available to stream world-wide in February 2018. Through his social media, Jones announced his next project will be a science fiction film, centered around the Rogue Trooper, based on the 2000 AD Comics character. Jones announced his engagement to photographer Rodene Ronquillo on 28 June 2012. They married on 6 November 2012. On the same day, Ronquillo was diagnosed with breast cancer. The couple have been campaigning to raise awareness for the disease and for early diagnosis since then. On 10 July 2016, Ronquillo gave birth to their first child, a son. On 1 October 2017, Jones announced that he and Ronquillo were expecting a second child. Jones announced the birth of their daughter  on 18 April 2018. ^ a b Buckley, David (2005) . Strange Fascination – David Bowie: The Definitive Story (Revised & Updated ed.). London: Virgin Publishing. p. 90. ISBN 0-7535-1002-2. On 30 May 1971, Bowie's son, Duncan Zowie Jones, was born in Bromley Hospital. ^ Graham, Caroline (8 August 2009). "Zowie Bowie: How a son of rock royalty survived a bitter rift with his mother to earn genuine success". Daily Mail. London. Retrieved 6 October 2012. ^ Jones, Duncan (23 March 2017). "Marion Skene". Retrieved 27 February 2018. ^ "WTF with Marc Maron Podcast: Episode 892 - Duncan Jones / Brendon Small". wtfpod.libsyn.com. Retrieved 2018-02-22. ^ "David Bowie Wonderworld: Press Archives 90s". Bowiewonderworld.com. Retrieved 2016-01-12. ^ Itzkoff, Dave (7 June 2009). "Son of Major Tom, at Ground Control". The New York Times. Retrieved 1 May 2010. ^ "Genealogy – Geni – private profile – Genealogy". Geni.com. Retrieved 2016-01-12. ^ Adams, Sam (2011-04-08). "Duncan Jones | Interview". The A.V. Club. Retrieved 2013-05-20. ^ Akbar, Arifa (16 August 2004). "FCUK, off: fashion label decides to rest 'tired' logo". The Independent, UK. London. ^ a b Sweney, Mark (6 July 2006). "French Connection and Beattie part company". The Guardian. London. ^ "Will Jake Gyllenhaal Crack Duncan Jones' Source Code?". DreadCentral. ^ Borys Kit (2013-01-30). "'Warcraft' Movie Lands 'Source Code' Director (Exclusive)". The Hollywood Reporter. Retrieved 2016-01-12. ^ "Paul Rudd & Peter Skarsgard To Star In Duncan Jones' 'Mute'". Deadline Hollywood. 2015-11-03. Retrieved 2015-11-04. ^ "Mute | Netflix Official Site". www.netflix.com. Retrieved 2018-03-15. ^ "Rogue Trooper Movie Coming From Warcraft Director Duncan Jones". Screenrant.com. 2018-07-15. Retrieved 2018-12-16. ^ "Cancer Campaign Fundraising Page". Fundraiseforbcrf.org. 2012-02-04. Retrieved 2013-05-20. ^ Sara Nathan (10 December 2012). "Duncan Jones wedding". Daily Mail. London. Retrieved 2013-05-20. 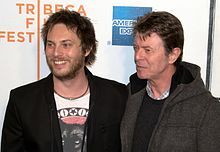 ^ "David Bowie's son announces late father was to become grandad". theguardian.com. Retrieved 11 February 2016. ^ Duncan JonesVerified account. "Duncan Jones on Twitter: "Incredibly excited to be able to announce that the Jones gang is growing again! @rodeneronquillo cooking up a little... girl!". Twitter.com. Retrieved 2018-12-16. ^ Duncan JonesVerified account (2018-04-28). "Duncan Jones on Twitter: "Speaking of which, our lovely little girl has a name. (We chose it a while ago) Zowie Tala Mabsie Jones. About time SOMEONE made use of my middle name, even if I wasn't ready to!"". Twitter.com. Retrieved 2018-12-16. ^ Duncan JonesVerified account (2018-04-18). "Duncan Jones on Twitter: "I am thrilled to announce that the sequel to the hugely popular Stenton Jones, has finally been unleashed upon the globe! Both @rodeneronquillo and her big, beautiful baby girl are doing amazing!". Twitter.com. Retrieved 2018-12-16. 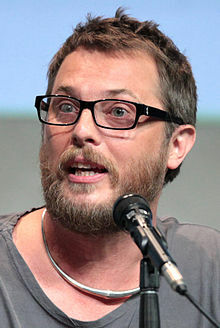 Wikimedia Commons has media related to Duncan Jones.